Let’s assume for a minute that “Hamlet” had been written as a comedy rather than a tragedy and that when Hamlet tells Ophelia to “get thee to a nunnery” she actually goes. How long could we expect before the recording contract followed? Music has always been a big part of convent life, much to the church hierarchy’s dismay, and musically talented women were much sought after. Indeed, it wasn’t unusual for a convent, much like a university today, to sweeten the pot a bit to get a talented novice to move inside their walls. “Musical skills and beautiful singing voices were so valuable that convents could even offer discounts on the dowries of gifted nuns, and decorous religious houses accepted girls from modest backgrounds,” says Silvia Evanegisti in her book Nuns: A History of Convent LIfe. Just don’t tell the Bishop about it. Well, we know from Act IV, Scene V of “Hamlet” that Ophelia was quite the singer, so had Polonious lived, he surely would have gotten a discount to send his daughter to a nunnery, as Hamlet suggested. Given the premium convents offered on musical talent, it’s not surprising that many of the female composers we know about from the Baroque era today were nuns. One nun whose work has managed to survive to this day is Rosa Giacinta Badalla, a Benedictine nun in Milan who’s believed to have lived from around 1660 to 1710. She had only one printed collection of compositions that we know about, Motetti a voce sola, and it makes one wish she had been given a recording contract. Her work is “remarkable . . . for its patent vocal viruosity, motivic originality, and self-assured compositional technique,” Robert Kendrick says in his Grove Music entry on Badalla. You can hear that virtuosity, originality, and self-assurance in “O serene pupille,” a beautiful piece for solo voice that also translates well to the violin. In this 5-minute video, we see musicians from La Donna Musicale in 2011 perform an excerpt from the piece using violin as the solo instrument. La Donna Musicale is based in Boston and it’s a company dedicated to performing classical works by women composers. To showcase the rich vein of music that’s come to us from the convents, a couple of publishers have released compilations within the last few years. Rosa Mistica is a highly regarded collection that includes a piece from Badalla as well as composers named Isabella Leonarda and Bianca Maria Meda. “This music brings such joy and peace to my whole being, and every one of the pieces on this album is so beautiful, it’s hard to find words that adequately express the astounding harmony,” says one reviewer on Amazon. Badalla’s work also appears on Concerto delle Donne, a compilation of female Baroque composers, including one of the most well-known of all female classical composers, Barbara Strozzi. This compilation isn’t limited to the cloistered, so it has a much broader range of work and yet the pieces still center around sacred music, as Baroque music by women composers often did. In this compilation, Badalla’s piece is called “O fronde care,” and she wrote the lyrics for the piece, not the music. Other surviving pieces from Badalla, including “Pane Angelico” and “Vuo Cercando”, have been transcribed and are available today. Another piece of Badalla’s, called “Non piangete,” is performed beautifully by soprano Roberta Invernizzi and cellist Elena Russo. You can listen to that in the video below. We’re fortunate this this and other works from Badalla and other nuns remain with us today, and hopefully yet more will be found in the musty cellars of convents someday. The work of composers as gifted as Badalla deserve a wider audience; it would be a shame to keep it cloistered behind the walls of a nunnery. There’s certainly a lot of charm in Goulding’s pre-Internet methodology for learning about classical music. (He says he knew nothing about it before starting his project, which took him seven years.) Basically, he culled commentary from the world’s great composers and from musicologists and others and determined his list of the 50 greatest composers of all time based on who the composers themselves and other experts held in high esteem. It should come as little surprise that at the top of the list are three names widely considered the titans of music: Bach, Mozart, and Beethoven. Indeed, Goulding calls these three the immortals, and says that their place at the top is so secure that it could never be tolerated, by anybody anywhere, that someone should try to demote them. He then lists eight demigods, all either Classical or Romantic composers with the exception of Handel, and then he lists two additional categories: composers of genius and artists of a high order. As you can guess from his labels, Goulding is quite the wit, and indeed the introductory part of the book is fun to read. The rest of the book is a fairly standard catalogue of the 50 composers , their principal works, and commentary on where their works fit in the context of musical development over the centuries. Goulding is trying to cover roughly 500 years of music, so it’s hard to give due attention to everyone who deserves it. But he seems to put too much weight on Romatic-era composers, who comprise 27 of the 50 greats, compared to the Baroque era, the period of eight of the greats. Really? Of the Baroque greats, you have everyone you would expect to have: Bach, Monetverdi, Couperin, Vivaldi, Telemann, Rameau, Handel, and Gluck (a Baroque-Classical transition figure). But there are so many who are not on the list. You have to wonder if Goulding gave too much weight to Romantic-era composers simply because he had available to him so much more information on them. Does it really make sense to have Camille Saint Saens, the Romatic-era French organist, on the list while Arcangelo Corelli isn’t? Or what about Modest Mussorgsky, a Russian Romatic composer whose music is noted for—what? Okay, he tried to compose music in opposition to convention. So, his music is rough, dissonant. But is his contribution to music really that much greater than, again, Corelli’s, whose work was pivotal for the violin and for the idea that instrumentals could occupy as important a place as vocal works? 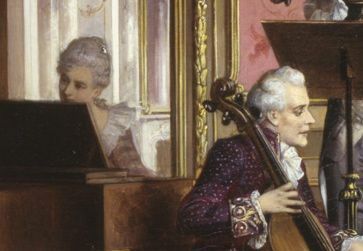 One of the defining characteristics of Baroque music is the basso continuo, or figured bass, which you can think of as a piece’s rhythm section. The harpsichord and cello often play this continuo role together (although any bass and chord-producing instruments can do it), creating what in rock is called the song’s bottom line or in jazz, the groove: the note pattern that creates the feeling of continuous motion. In the continuo, the harpsichord, as a chord-producing instrument, accompanies the bass line with a chord series that thickens—or harmonizes with—the bass line. The continuo is sometimes called figured bass because the composer would simply write chord figures below the musical staff and let the musician figure out how to realize the harmony. Once the continuo is realized, the foundation is laid for the violin or other solo instrument to play the melody line on top of it. The rise of classical music, with its cleaner textures, shorter melody lines, and quickly shifting dynamics, left little space for the continuo. Whether it’s really accurate or not, I like to think of jazz and rock ensembles as resurrecting the continuo in a new and cool way. No doubt music theorists would quickly disabuse me of this notion, but until they do, I think of the basso continuo as the part of Baroque music that makes it groovy or cool, which I know are not terms you hear associated with Baroque music. But maybe they should be.